What’s A Mennonite Girl To Do? This may look like an ordinary pile of rocks on the beach, but look closely … very closely. If you are a sea glass collector you will see a jackpot of sea glass. 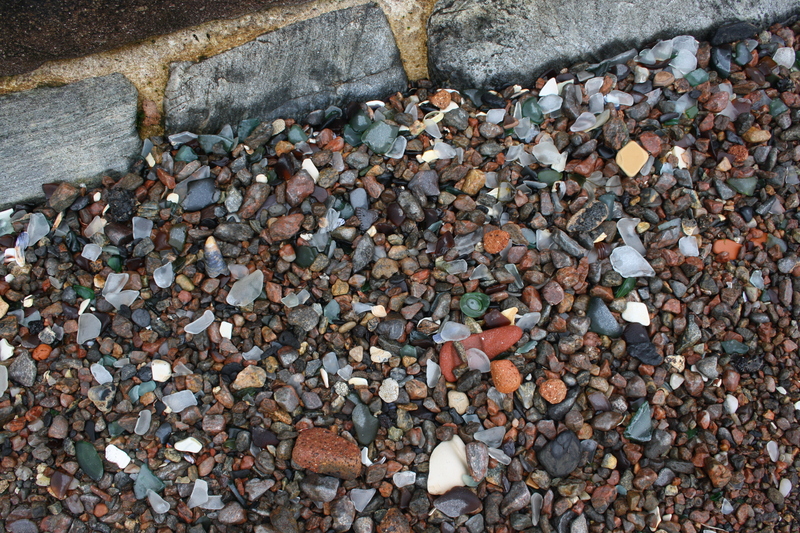 And if you aren’t a beach glass collector and want to be, look carefully at the colors and shapes, and you should begin to be able to pick out the whites. They are sort of frosted. Another thing before I continue, picture that this is one very small section of a harbour I stumbled upon. In other words, there was loads of glass on this beach. On most beaches you can walk for five minutes before you find one piece of glass. Imagine sitting down and picking up a bread bag full of the stuff. So that was the situation I found myself in. 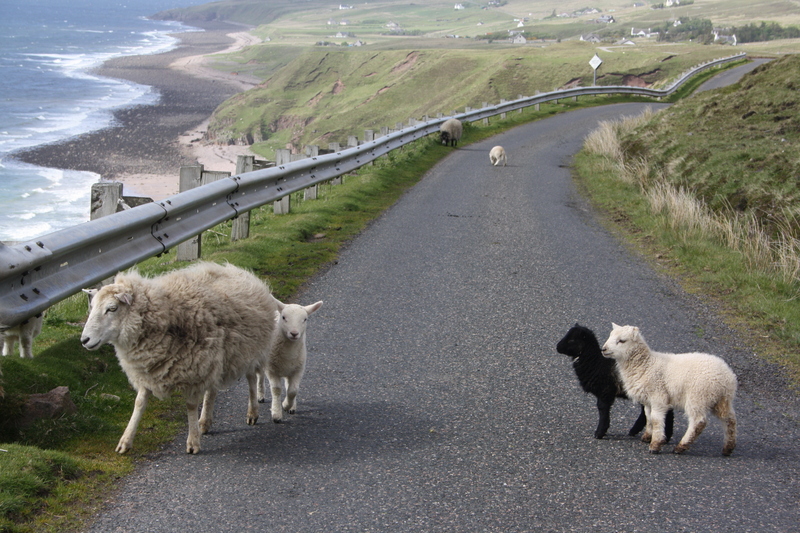 Thing was, we were in Stornaway, Scotland. This is located in the Outer Hebrides. Islands way out there. Backtracking a wee bit. About 10 days. Naw, I won’t tell you ten days worth. Short version. It was May. A wild windy May, and if you think you’ve experienced wild windy Mays, go to the northern parts of Scotland. I thought I had experienced extreme weather changes, but this was something else. Suffice it to say, all of our clothing was well used, and thank goodness for Mountain Equipment Co-op clothing. Layers and quick dry became deeply meaningful to my heart. Maybe I’ll just show you one picture so you can see how nice it was at times. But we were in a rental car, traveling many roads, and at the time of finding the mother lode of sea glass were in Stornaway, as previously mentioned. How we happened to find the beach was this. We had arrived on the ferry, toured the Isles of Lewis and Harris, by the way the white sand beaches to the south are stunning. Arrived at our B & B hungry after all the beach walking, but on the way out the front door to find a restaurant heard boisterous talking and laughter from behind the closed door that said ‘lounge,’ so in we went to seek advice regarding food. Inside we found six people, sitting with open Scotch bottles and weeny glasses and trays of lovely little food spread on the coffee table. I know this sounds corny, but these six people live about 140 km away from us in Nova Scotia. Yes. We sat for a while and had a wee dram to warm our appetites for food. Off we go and found a pub on the harbour. Very nice. Not very busy. Big fancy restaurant upstairs. We order a pint, decide to sit a bit before ordering food to enjoy the atmosphere and listen to the accents of the locals. The moment comes when we need food. Right away. We flag the waitress and I ask twelve or thirteen questions about items on the menu before choosing. This used to drive my husband a bit crazy but he’s grown tolerant. She leaves, but returns shortly with bad news. An extremely large party at the restaurant upstairs, which is where the kitchen is, has just ordered their meals. Oooh. Very bad timing on our part. We wait and wait, and wait. Meanwhile my husband gets up to go for a little walk outside, to stretch his legs. He returns about 5 minutes later with a big grin on his face. No the food hasn’t arrived. But he has good news for me. He tells me he stepped down into the harbour, and as he has learned to do, since my sea glass fetish began, looked down, and so discovered the abundance of glass. I’ll skip the part of us wolfing down the food. The next day, we came back. And I filled two bags in very short order. That was all fine. We had a car. It went into the trunk. And the glee on my face was a site to see. Fast forward to going home. We flew with Air Canada. They only allow one bag these days, unless you pay. My husband has Scottish roots, so he had been busily collecting Scottish things to take home to give to family. So his bag was full and heavy. After the Scottish part of my adventure, I was going to spend a week in Cambridge, England with my smart-as-a-whip niece who studies there, and two other lovely women. From there we were heading to Florence, Italy. That is all relevant because I did not want to lug around two bags of sea glass. The stuff is heavy. So herein lies the dilemma. What to do? I love the glass. I want the glass. It is free. But now what? Royal mail to the rescue. But this decision is made after careful consideration. I always carry a little calculator but still manage to get confused with local currencies. The bottom line is, I couldn’t really pass up the opportunity. Sea glass. I didn’t need it. I wanted it. I mailed it. It arrived at our post office several weeks later. In two boxes. And when the assistant post mistress picked one of the boxes to hand it to me her face went gray and her eyes grew wide. “It broken!” she said, looking at me.